If you’re bringing children from 2 to under 12 years old with you when you fly, let us help you and the kids have an enjoyable journey. For their safety, child passengers aged between 2 and 12 years old travelling on a Cathay Pacific or Cathay Dragon flight need to be accompanied by their parents or guardians (at least 18 years old) at all times. Children under 6 years old must travel in the same cabin class with their parents or guardians. If your child is registered as an unaccompanied minor, we will take good care of them for you. If your child is under 24 months old, please check out our travelling with infants section. 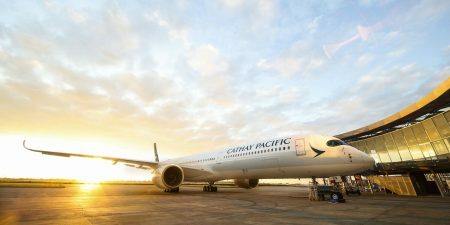 There are two types of tickets that you can buy if you want to bring young children on board a Cathay Pacific or Cathay Dragon flight – one for infants and one for children. These are available for booking online. A child ticket is especially convenient if you bring your own personal car safety seat or plan on using other safety devices. Please note that not all safety devices are usable or available on all types of aircraft or classes. If you get a child ticket, your child will have their own seat and also the usual baggage allowance. Every flight with us is an opportunity for fun. Here are some of the ways we help your kids enjoy their flight. Both Cathay Pacific and Cathay Dragon have a fantastic selection of family-friendly movies from cartoons to anime, all especially picked for kids. Kids 3-6 years old will be offered a colourful children's fun pack full of goodies to keep them occupied on the flight, which includes stationery, games, and activity books – all of which they can take home with them after the trip. Please note: We are unable to provide the fun pack on flights travelling solely within Northeast and Southeast Asia. We serve healthy and nutritious children’s meals with colourful and child-safe cutlery - please place your children's meal request in Manage Booking as far in advance of your flight as possible. Please note: We cannot reheat or chill your personal food items for hygiene reasons. There are specially designed children play areas at Hong Kong International Airport (HKIA). Check out their location at the HKIA website.